During the AFC Cup competition draw that held in Kuala Lumpur today, the Blues were presented with a cheque of $100,000 for winning the South zone group of the competition. It was presented by the Asian Football Confederation’s (AFC) General Secretary Dato Windsor. The draw also made the Fed Cup champions Bengaluru FC’s way up the AFC Cup as they were drawn to the North Korean side 4.25 SC in the 2017 AFC Cup Inter Zone Semis in the championship. 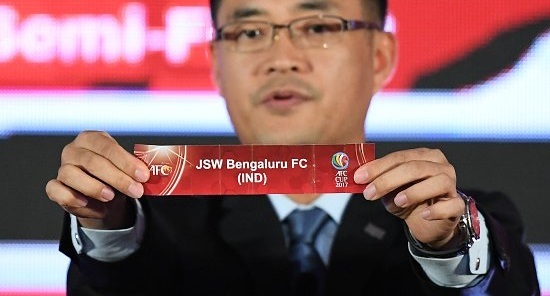 This fixture is set to take place on August 23rd and September 13th in the home and return legs with the first leg to be played at Kanteerava Stadium while the second at Pyongyang. 4.25 SC qualified to the Zonals after winning the East Zone Group. If Bengaluru FC gets through this round, they will meet the winners of the tie played between Tajikistan’s FC Istiklol Dushanbe and the ASEAN Zone tie winners between Singapore’s Home United or Philippines’ Ceres Negros. 4.25 SC being a new team to the Federation Cup Champions, it would be interesting to see how Albert Roca prepared his men for it. 4.25 SC would want to take up this opportunity to proceed in the competition after appearing for the first time in the continental stage since 1992.